If you are thinking about a building project within the next few months, King Group, can provide the dedicated and professional service to get the project completed the way it should be. Builders need to provide several services and you can count on King Group to provide guidance and professional service from the beginning to the end of the building process. We can arrange for a free consultation and site visit to your home, where we can discuss and contribute to the design process giving the benefit of our vast past experience. During this consultation we carry out a site survey and gather all necessary information needed to cost the project. We are happy to work from engineers or architects drawings when available. Drawings are not essential for standard conversions or extensions when carried out by professional contractors who have the experience and knowledge to know exactly what is required to comply with building regulations. However, if it is necessary to have planning permission for the extension, you will need to put forward architects drawings to the local authorities to gain approval. We can advise if planning permissions will be required and, if requested, we can recommend affordable architects and engineers, with whom we work closely with on a regular basis, who can assist in the planning application process. We can guarantee that our pricing will be among the most competitive you will receive. This does not always mean we will be the cheapest because we ensure our quote will include everything you will need for the entire project and there will be no hidden costs. Although our rates are competitive, we always use top quality materials for the job. We do not cut corners to make a saving by using cheaper and inferior raw materials which could result in long term problems for the client. The main reason we are able to provide such competitive quotes is quite simply because of the speed at which we can get the job done and the purchase of the materials in bulk. It is imperial to our company that staff possess a strong work ethic and work continuously until the job is completed. Subsequent to a meeting with the client, a detailed quotation will be supplied to you for the entire project. We will itemise each of the tasks being undertaken and what materials and fittings are included- this system eliminates further expenses and hidden extras to ensure there will be no doubt as to what is being involved and excluded from the quotation. Normally a Clane Building Works quote will include everything needed for the job. Payments are generally made on the basis of work done by us. Stage Payments are agreed with the client before any work commences. Unlike some other building contractors we never require “money up front” other than a small booking deposit of approximately €500 to secure a start date. As mentioned above, we only use the best raw materials available for the job and we don’t make savings or cut corners by using cheaper or less effective products. When the quotation is accepted we discuss and agree start dates and advise on how long the project will take. Once we commit to a start date we guarantee to keep to this date regardless of any other projects that we may have underway at the time. We always give our clients a realistic completion date for the project. We are aware that clients make advance preparations for our work , such as scheduling time off work etc. Regardless of other projects that we may have underway at the time, we continue with each project until completion and without interruption. Because we dedicate specific staff for the duration of the project, we do not therefore need to re-allocate these staff to different projects at the same time. We are aware of the lifestyle disruption caused by construction work in your home and we try to minimize this as far as possible. For the duration of the project, the client will have an ongoing dialogue with our project manager. This is necessary to discuss the detail of the work being carried out. Once the project is completed as agreed and signed off by the client, we will remove all of our working materials, tools, waste materials and skips. We then complete a final clean up thus returning the site to the client in good condition. Building a new house of extension can be one of life’s most rewarding experiences. Not only in terms of providing a home for you and your family, but in creatings something that will be a great achievement for many years. With a proven track record consisting of over three generations in service and thousands of satisfied customers you will know you are in good hands. Clane Building Works began building homes many years ago and have improved in all methods of construction throughout the generations. 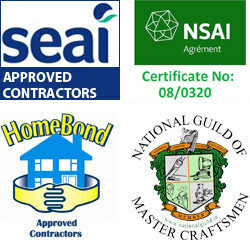 Clane Building Works are full members of the National Guild of Master Craftsmen and Homebond, we actually carry out remedial works directly for Homebond rectifying problem builds. We are fully insured and actually have addtional insurance cover to cover client’s homes while carrying out renovations or extensions. All our new homes come with a 10 year Homebond Guarantee.